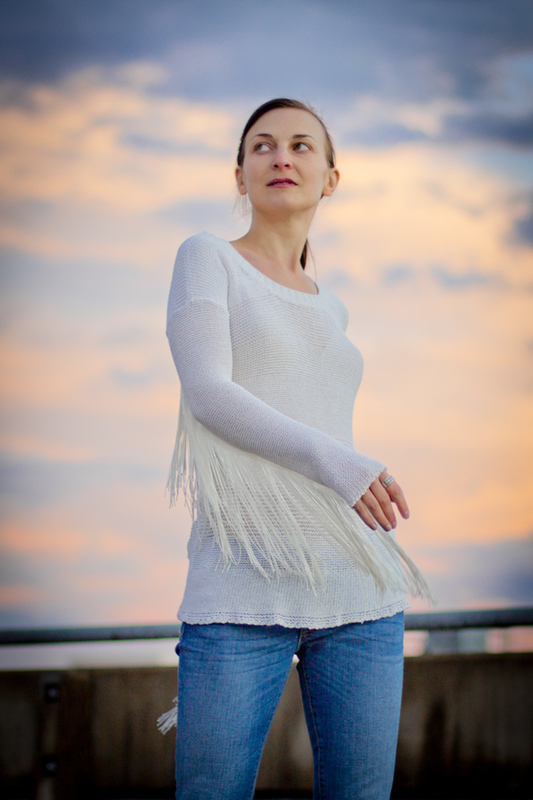 I decided to make a fringed top a while ago but have struggled to find the perfect material. Well, here’s some news – you can get a great variety of colors and lengths in Lincraft! 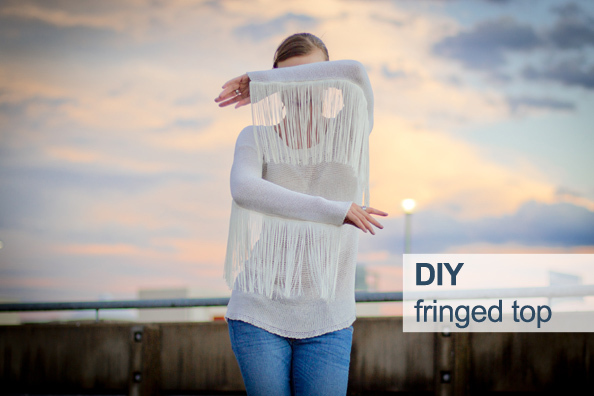 As soon as you’ve settled on the garment to be ‘fringed’ this is possibly one of the easiest DIY projects you will have ever make. It took me half an hour one afternoon while Anastasia was sleeping. 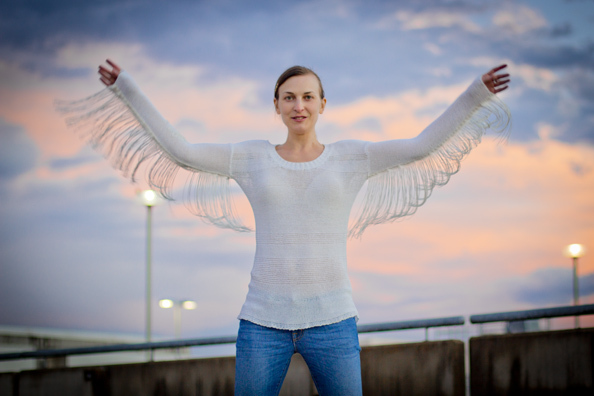 Yet the result was quite impressive: an old white top was quickly transformed in a hot new piece that I’m going to wear a lot this summer with denim cut offs to the beach or with white wide leg pants and dressy sandals for a dinner out. With this simple how to tutorial you can do it yourself too. Just have a closer look at your wardrobe – I’m sure you can find something nice but rarely being worn. That’s the one for this project! 1. Attach the fringing to the end of the sleeve with the bulldog clip. Cut it at the end of the seam where it meets the armpit. 2. Attach the fringing at the sleeve by looping the thread through the jumper enough times to cover the width (short side) of the piece. 3a. Stitch all the way along the length of the seam. I.e. from the hand to the the armpit. 3b. It’s easier if you slide your hand inside the sleeve and attach the fringing just in front of where you’re sewing as you go. 4. 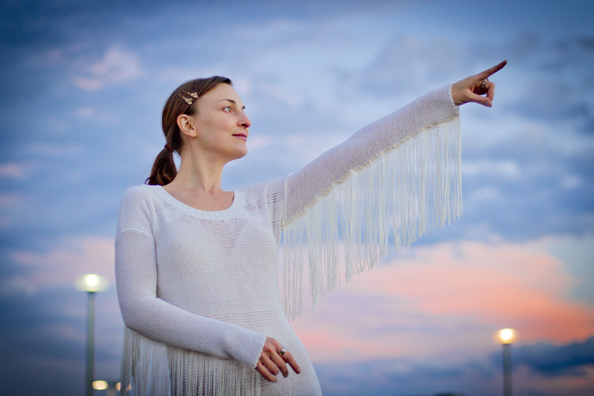 When you reach the armpit, repeat Step 1 at this end. Your new top is ready – enjoy! What I also love about this DIY project is that with the same technique you can re-create these beautiful shoes or this top. PS. In case you’re wondering where are the sequins, that will be revealed in my next DIY post soon. One good thing at a time! Looks fantastic Maria, you are so clever! i LOVE this!! so easy, yet so dramatic!!!! casual with a twist, by the way, i love your pics for this – perfection!!! Looks great, I think I might do it to a black mini! Love this top! So happy I found you on Twitter!